October | 2010 | RicksBlog.com Home of "The Domain King®"
So now everyone can clearly see that valuating domains by ppc earnings was silly at best. There was NEVER any correlation though many correlated them anyway. Made no sense then and I wrote about it time and time again. Now it is clear what I meant. So if you bought a domain on a flawed equation, you have to recalibrate that and find something to base it on that is constant. Or at least in tune with reality. So folks always ask how do you valuate a domain name? My answer is always at a bare minimum, compare to real world costs. That is a basis. That is a starting point. That is a foundation. That is before you even get to the domain name itself. It does not matter what the domain is, if somebody else wants it, it has value and ost sell way short of what the buyer is willing to pay. After 15 years of being told I am wrong on everything up and down the line let’s start by saying it was just not understood. Or it was just a little early for the masses to get their heads around. Or maybe I was just right all along and had to be patient for 20 years for everyone to clearly see it. You decide to open a small store in your town. Every town has different rents and housing prices. If you have prime domains then compare to prime retail space in a big city. If it is off the beaten path, then find out what rents are in a more rural area. You will need a cleaning service. You will need lots of other “Stuff” that all costs money. Permits, fees, taxes, inspectors, where does it stop? So a domain is only worth the idea behind the offer. Small idea, small price. Big idea, big price. So while everyone is looking a million ways to valuation, to me, this is where you start. This direction. The discussion. In “The Social Network” there were some really good scenes. But one I like was the story about 14 trout or one gigantic fish and which one do you get your picture taken with or something like that. With the exception of the “Sting” and the “Cuckoos Nest” and maybe a handful of others, I don’t go to see a movie twice. I will for this one. The trick is to get into the minds of those watching and be a part of their dream. When I grew up you went to Harvard to become a Doctor or a Lawyer. Are those days over? I believe they are to the degree that the website dream is in forefront of all their other dreams and ambitions. I believe this movie changes the game. Today, no matter where you are going to school and in nearly every sector, these folks are all thinking what they can develop on the web that will revolutionize their industry, their hobby, their product and they can make a lot of money. This movie not only reinforces that, it gives you a pathway to get there even if it is a loose outline. The movie the Social Network is simple and powerful. Everything starts with a domain name. And when you get big, it is okay to buy the better domain. So I am minding my own business and a get a call. 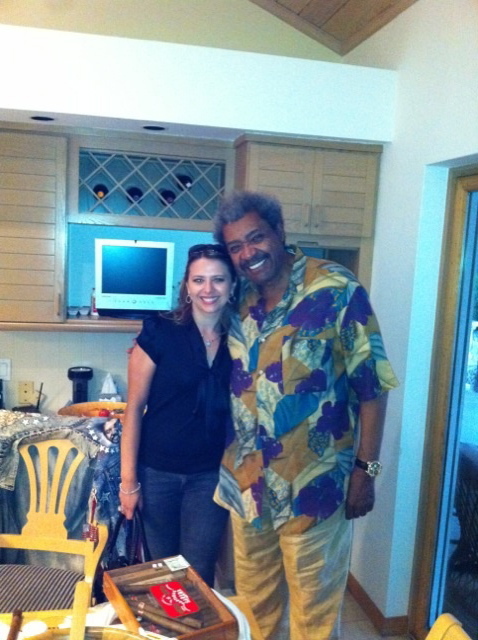 3 Hours later I am sitting across from Don King at his dinner table. I meet some very interesting people. Really interesting people. They think very big. I had a chance to watch him put some things together tonight. I think it is a big thing to move mountains. I watched worlds get moved into place tonight. A master in action. Say what you will, but to watch the greatest promoter of our time promote something from thin air is more amazing than anything Kreskin ever conceived. Simon T Bailey talked about brilliance the other day. I witnessed brilliance tonight. No stages, no audience. Just a few people on a mission. A big mission. If you don't believe you can dream it and do it, you are wrong. You will be hearing a lot about what he is doing and putting together. Constructing. So I can't say much more than he hinted at the other day but tonight I had a first hand look at something unique and incredible. They can't teach you this in a classroom.And the coolest was to see his eyes light up with his fascination of domain names. There were no rhymes tonight. Just reasons. 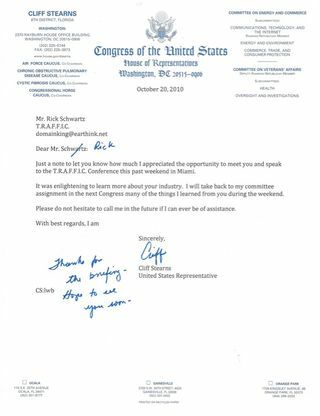 Letter from Congressman Stearns on His Visit to T.R.A.F.F.I.C. I just received the following from Congressman Stearns and wanted to share it with you. One of those moments. I don’t want to get political here so I will stop and just focus on the numbers. So bare with me as I make my way through this political mine field and try to make my point that is not political.It is hard to ignore the Juan Williams Story. If you are not up to speed, take a moment. Read both stories and others. Was he unfairly fired after 10 years with NPR without so much as a hearing? Was what he said so over the line that it merited firing or is something else going on? Free Speech on attack? Did he say something that perhaps the majority agree with? Shut him up, you are shutting up too many too keep quiet. Lots of people and groups between a rock and a hard spot. Juan said something that many feel. They won’t take a poll on what he actually said because the number they would get would be unsettling and the media does not know how to deal with it nor want to. But they are about to be forced to and it will unfold in front of all of us. This is a BIG story about to get bigger. About to explode. NPR will be the biggest loser. Juan Williams a big winner.....but more important, read on. There are watershed moments in history or at any point of time that shifts people in a real and effective way. Jolts them! Here is what I see because of the Juan Williams episode. I am a numbers guy. Just follow the numbers. With the U.S. elections just days away, there is a significant number of Americans that remain undecided. On the fence. Can go either way. Like a feather and a breeze. That is in the midst of a huge change and it will be the Juan Williams story that may do it. I don't want to go any further or get political. All I do is follow the numbers and RARELY do you see numbers when 75%-90% agree about his firing. That cuts across political ideology. Just the numbers. And to have it play out over the days preceding the election is could be powerful and the impact could be absolutely stunning. If it happens, it will never even be reportrd on. It's invisible. That's what I see and I am sharing it with you because it is an invisible wave. This time it may play out in votes. Other times it can play out in sales. But picking these points in time out are vital to benchmarking your gut. Right or wrong the answer calibrates that gut. When you focus on the numbers you can predict a reaction. In domaining, we predict reactions before the event even happens. There is a connection. Predicting human behavior after they are exposed to a catalyst can be rewarding. That is why there is advertising. But things like this is an advertisers dream and a political dream all rolled into one at exactly the most important time. Invisible to the naked eye. But that is what THESE eyes see. I am simply sharing what I see and how it may play out based on the numbers with a keen gut for the current pulse of things. TRAFFIC 2010 South Beach. One for the Record Books. How Was it For You? I got home yesterday afternoon after an historical T.R.A.F.F.I.C. event. You will hear it dozens of times. 'This was the best TRAFFIC since 2004'. Don't take my word for it. Listen to the attendees who I hope will comment here about their experiences and the VALUE of TRAFFIC. So that is it, I am just asking to post your conclusions after the event and after the 'Expense'. Was it an expense at all?? I believe we have provided lifetime memories and a level of opportunity few have ever seen. I think the .CO party at the Versace Mansion was probably the best ever! The sessions were pointed and well attended and an era of TRAFFIC Domain auctions has ended. 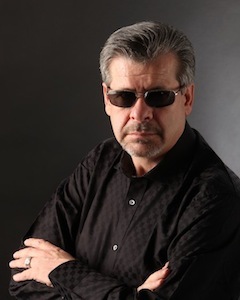 In 2011 Howard and I are going to change how the auction process is done. Change it from the ground up. More about that in a future post. But we are going to FIX the things you are complaining about and rightfully so! With nearly a year to plan I think we can agree that the 'Monster in Miami' was as advertised. Lots of news will be coming out over the next days. Myths will be met with fact. Like Don King being mobbed on the stage for 2 HOURS after he spoke. And yes, some did not have a clue what he was talking about. Yet others got the message loud and clear. Riddles are never obvious. Reading between the lines is mandatory. This chapter is not done. In just a few hours TRAFFIC will once again take center stage for what is set to be one hell of a show! One year of planning and an industry ready to break out. I'll keep it short. This will be one for the record books and every company and every domainer here knows it. The Largest TRAFFIC show since 2007. Final Schedule Posted. The Largest TRAFFIC show since 2007 is about to take center stage when 300-400 professional domainers invade Miami Beach. and it is wall to wall with great speakers.The final schedule is now posted and you will see we mean business. There is no dead time. We tackle issues MANY won't be happy about and only at TRAFFIC would that happen. Others will be delighted. Some will take advantage of the opportunity and solve problems for a profit. The top 20% and those wanting to climb their way up in life will assemble one more time. Howard and I make no apology for focusing on the 20%. Life is short and you have to make the most of your time. If that offends some, then we can live with it. I know it does not offend the 20%. They thank us for keeping the noise out and the business and deal making in. Look at it like this. I used to do a lot of advertising. My products appeared in well over 100 trade publications. These publications were audited and that had a lot to do with the rates they could charge. In that business there are paid subscriptions and free subscriptions. So if it was 100% paid, that was a much more potent choice for advertising and the results would always follow. TRAFFIC is 100% paid show. And I guess I am the perfect person to say 'No'. Everything else is desperate and weak. Other than our Keynote Speakers (Which we PAY TO COME) everyone pays. Everyone has skin in the game. Everyone has an investment of time and dollars and they MUST get a return. MUST. So our show has a certain level of focus and achievement. When everyone is like that, you have the MAGIC OF TRAFFIC. That is what always makes TRAFFIC different. Say what you want, but there is a reason that the history of the Domain Industry and TRAFFIC are so weaved together. It is not by accident. It is by design and formula and a vision that encompasses more than just a show. The show is just our vehicle to accelerate acceptance of domains as a multifaceted investment the likes of which the world has never seen before and at the same time putting us together so we can help each other grow , prosper and progress. From Delray to South Beach via Las Vegas, Silicon Valley, New York City, Orlando, and the countries beyond, TRAFFIC is all grown up and the world is about to catch up with the world stage we have been on for so many years. The selling is over but the job now begins. Howard and I and our families are on a mission to make your time with us the best ever! That’s what we do. First class or not at all. The right way or no way. When you look back at life you will treasure your moments at TRAFFIC. Not only is it part of your business, we are all a fraternity of very interesting people with great hearts and wisdom beyond our years. Have one of these on your website? Mini site? Whatever site? Let's be simple. Our single biggest deficiency is not having a cash register on a domain name. That turns it from a domain to a business. Forget the rest of the stuff. Get one item, get a cash register, get a sale and then start to grow. The new 'Enter Button' of the era. Domain Lottery. Are you in the Game? 2 Cents a day to be a Player. Many times people refer to domaining and domainers as like guys trying to hit the lottery and usually not in the most flattering way. The buy and hold guys. But I am here to tell you that is exactly what a domain name is. A lottery ticket. An $8 lottery ticket that renews annually. That is 2 CENTS a day. 2 cents a day to play the domain lottery. So what’s wrong with it being a lottery? Especially if you can generate enough revenue to make it free? At the end of the day that’s all you really need to do when you play it like a lottery. Cost you nothing bit have thousands of horses in the race and of you can generate some income on top of that. Why not keep playin’? It’s okay, you are already screaming and beside yourself. Most of you won’t agree. Ok, so what? You play it your way, I’ll play it my way. You get to look down on me and I get to laugh at you. So what? Until you have a cash register at the end of that domain, we are both in the same tunnel just going to the center from opposite ways. Ooops, almost forgot to mention the most important part. When you play the regular lottery, you get random numbers or you pick them. But it is ALL chance. Nothing more, nothing less. With a domain, you get to look into the future and if you understand business, human nature, progress, need, want, desire, SALES, PROFIT, CONSUMERS, how things will unfold, etc. etc. you can pick winning lottery tickets years in advance. It is almost cheating! And if you do it right, then those lottery tickets give you the dividends to keep buying more and lottery tickets with ZERO out of pocket expense. So do I play the domain lottery? You betcha! Every day of my life!! So with free time and free domains, you are free to conquer whatever, whenever and keep growing, expanding and staying ahead.